What the bleep, NJPD? Kicking an innocent flaming bystander? At the end of a police chase, a bystander, who is on fire(! ), rolls on the ground and removes a flaming shirt or jacket to put out the fire. As if his night wasn’t bad enough yet, next a New Jersey cop kicks him in the face as he is getting up, and other officers join in, dragging and (beating him?) mistaking him for a criminal. Officials have “serious concerns” about a video of New Jersey police officers kicking and dragging a man who was an innocent victim in a fiery crash. The incident came after a police chase Sunday night in Jersey City where officers tried to stop a vehicle driven by 48-year-old Leo Pinkston. Police fired multiple bullets at Pinkston’s vehicle, but the pursuit ended when he crashed into a utility pole and caused a fire, NJ.com reported. In the video, another driver whose car was also wrecked in the crash emerges on fire from the burning vehicle. When he rolls on the ground to put out the flames, a police officer starts repeatedly kicking the innocent victim, as others stomp on him. 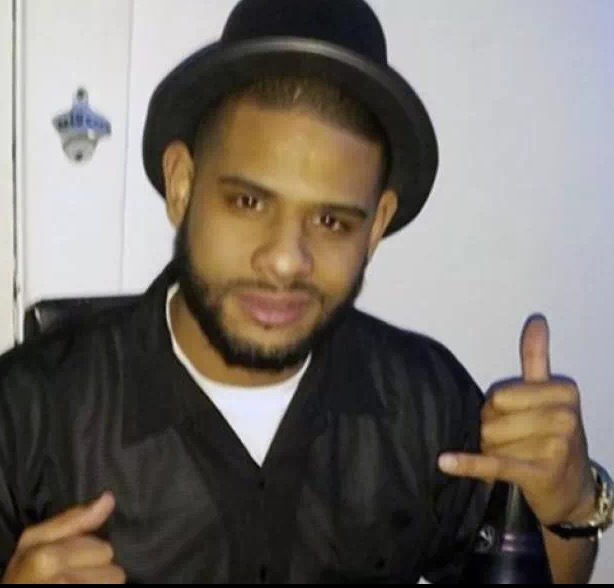 “Our investigators have reviewed the video and we believe with certainty that this man is the bystander from West New York who suffered burns, not Leo Pinkston, the individual pursued by police,” Hudson County Prosecutor Esther Suarez said in a statement. The victim remained hospitalized on Monday in critical but stable condition, the Associated Press reported. No officers have been charged in connection to the video. “We have serious concerns about the conduct of this pursuit, however, we are reserving judgment until the conclusion of the prosecutor’s investigation,” Jersey City spokeswoman Jennifer Morrill told NJ.com. Pinkston faces charges for eluding and aggravated assault. Carmine Disbrow, the president of the city’s police union, said the video “clearly shows” the officers acted quickly to extinguish the flames and pull the man to safety. The video shows Miguel Feliz rolling out of a burning car while on fire. A group of cops then surround and start kicking and beating him as they drag him onto the street. In the video I watched, the bystander seems to get the fire put out on his own first, with no help. Then he gets the bonus brutality. Forgive me for not complying instantly officer, as you no doubt observed, I was quite very recently on fire, and also had no reason to think I would need a swift kick in the face or to be dragged on cement. My mistake. Sometimes you are just in the wrong place at the wrong time, already having a crappy experience with your body reacting in an instinctive unavoidable human way to a physical situation, when a crazed person gets a wrong idea, assumes you are someone you aren’t, then attacks you. Next, the rest of the good guys jump in and join the lynching, beating the hell out of you. I have family in law enforcement and know cops have to react quickly, but seriously, what are the odds that a guy who was just on fire is going to attack anyone? The threat was already neutralized even if he was the perp, which he wasn’t. « Did Russia Interefere with the US Hacking its Own Election?